Small, medium or large arbor? How resistant to corrosion is your fly reel? For instance if standing on a stillwater fishery there is a good chance you will need a 10 foot 7 weight this will help get you out into the water from the shore especially if there are winds present. This is not so important if you have access to a boat and you can drift around the lake with your rod and that case and 9 foot 5 weight would be ideal. Also, inshore saltwater fly fishing you will need that extra push required to get past the breakers especially with an onshore wind then an 8 weight rod would be better. If you plan to go fly fishing for predator fish like Pike or Muskies and so forth these require large flies and will require a 9 weight or 10 weight rods to turn over the flies properly and then land these larger fish. So there you have loads of different setups. You can buy fly rods anywhere from about 5ft up to 15-16ft double handed spey fly rods and these all require matching with the correct fly line and also the reel, the container for that fly line also needs to match. As you can see there are many options for a fly rod so its best to know what type of fly fishing you intend to do first. 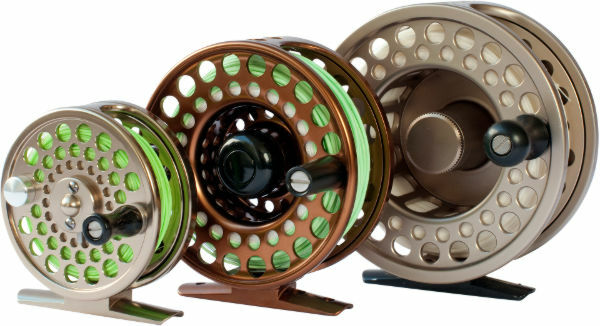 On top of the above other options that you can get for the fly fishing reels are drag systems, arbor, which is how the line is coiled on the reel, corrosion protection, weight as in the actual physical weight of the real the lighter the better and how that reel has been machined or pressed out of the materials it’s been made from. As mentioned above fly reels are manufactured in different ways and from different materials. The way in which these are put together makes a difference to the actual weight of the fly reel. The lighter the reel the better as you will be able to fish for so much longer without getting tired. Rod manufacturers have now made further progress into lighter and lighter fly rods and so the need to match these with lighter and lighter reels is important. You want the rods to sit nicely in your hand when you grab it in the fishing position. If it wants to tip in any direction it means the rod is too heavy or the reel is too heavy for the setup. Ideally you want it to tip slightly back or lie level in your hand this makes for a nicely balanced outfit that will fish well all day long. There are reels available now weighing around 3oz for a 5 weight. However when the fly line and backing is added usually another 1.5 oz it takes you to around 4.5 ozs. The average reel weighs around 4.5-5 ozs taking it to around 6 ozs when loaded something to bear in mind when choosing a rod to go with it. Let’s look at this real drag systems first there are several options again like everything with fishing going from the basic standard click right up to the disc washer system of a sealed drag system. Seal drag means that no debris can get into your system causing problems with the drag making it stutter or stop. Sealed drag systems are very efficient. The Startup inertia of them is very low and they go to full tension with one turn of the knob compared to other systems that may need several turns. Ideally you want the tension to turn from high to low within one full turn of the knob any more than that and it becomes fiddly. Some of these drag systems have been specially machined and manufactured with fiber washers instead of cork washers that is used in the more basic ones. Fiber washers will last a lot longer and give you a smoother drag. It has been noted by many fly anglers that the cheaper reels with cork washers do stutter and stammer when in the drag. If you’re playing a fish and that happens it does not let the fish take line effectively out of the real and there’s a good chance that the hook will come loose. On the other hand if you’re just planning to fish your local river on a weekend basis then possibly a cheaper option will be good enough just keep up on the maintenance of it to keep it working properly. Next we have the reel arbor, that is the way the reels spool is set to wind the surrounding line. There are three options really in this, large arbor where fly line pick up is very fast because each turn of the handle brings in a good amount of line, mid arbor which is smaller and each turn will be bringing in less line and then low arbor which is like the old standard reels of past and it means on each coil of the line is small and wound very tightly around the center of the reel. The small arbor reels of past left fly lines with coil memory on them meaning that once you cast a line out after it had been sitting on the rail for a few weeks it’ll be all coiled up sitting on top of the water not very pleasant and not easy to fish. You can uncoil a line by taking it, stripping it off the reel and stretching it out ideally with a damp cloth in one hand and pulling it through your hand. You can usually straighten it out to get fishing for that particular day but this will happen again the next time you reel it up and store it away for your next fishing session. That’s when larger arbor came into production as they help you pick up the line a lot quicker with each turn of the reel and it has less memory recoil in your line. Ideally you want to buy a large arbor reel and most of the manufacturers now make them as standard. There are a few that seemed to go for the mid arbor as their preferred option as you can carry a bit more backing on the reel so if you’re going for fish that are going to strip loads of line from you the medium arbor might be the way to go. Backing line is getting thinner and thinner and buying a decent backing fishing line you can still get loads on your reel along with your 7, 6 or 5 weight fly line without a problem so the larger arbor will work too. Next we have anti corrosion this really depends again where you are fishing if in the saltwater then it is imperative that you keep an anti corrosion reel on you at all times but even with anti corrosion properties it is still advisable that you run it through fresh water when you finish your trip to neutralize the salt. Metal will rust when damp and even in freshwater fishing in lakes or rivers with a damp reel stored away in a bag and left in the shed or garage there is a good chance that when you come back to get that real to go for another trip there’s going to be some rust on it. You need to look after your gear to keep in tip-top condition especially if it’s not got anti-corrosion properties built into it. Rinsing off debris and dirt, greasing the bearing and cleaning out the drag are all things you will need to do with reels in the lower end market more than those i n the top end. So if you want one that is maintenance free or at least minimal then go for the top category. If you have the budget and I’ll suggest you go for a reel that is a made from aluminum and anodized the anodization process is one where electric current is passed over the surface of the aluminum this causes a coating to be produced on the layer or oxidization. This process then proofs the reel from further corrosion and many manufacturers nowadays have fine tuned this process so that it actually colors the real in a certain way to give it a nice effect to the finish of the reel. Reels that don’t have a sealed drag we’ll pick up problems and when you’re out fishing you will get dirt and grime in your reel as you fish, you leave it in the water, in the bottom of a boat, on the banking, so there is a good chance you’re going to pick up some dirt and grime and that will work its way into the disc drag system. If you clean the reel when signs show then it should keep you going for many a fishing trip. So that’s the main areas to look out for when choosing a fly fishing reel, weight, size, drag, arbor and anti-corrosion. All have their benefits and you will pay heavily for the top options but as a beginner you can come up with a compromise somewhere your budget allows. I hope you found some use of this post and can make a better decision the next time you want to get a new reel. I never thought that the weight of the reel matters before but I guess it does. I am thinking of getting a present for my brother and he is a beginner so I should choose one which is really light, right? So he can practice fishing longer. What is your take on this? You are partly right, you need the reel to match the rod you are going to fish with. If the reel is too heavy the rod tip will be forced high in your hand if its too light it will fall forward. If you go for the lightest reel you need a similar lite rod to match to it and then you will be able to fly fish all day without fatigue, this will come at a price though. A good option is to buy a fly fishing combo these are already to fish with matching rod reel and fly lines perfect for beginners. Then when you get more into the sport you can choose rods, reels and fly lines to suit your needs. My son wants to learn fly fishing, so this article came on time. We have a pontoon boat, and every weekend we go sailing. You have provided excellent info, and I thank you for it! I’ll show this article to my son so that he can already start learning:) Thank you for this useful post! Great to hear your son is taking in up fly fishing. I would suggest he goes for a combo kit which supplies a rod, reel, fly line, tippet and tube all connected together and balanced for a perfect beginner starting point. Later when he gets more into it he can upgrade his fly fishing kit that is more suited to the type of fishing he wants to do. I have wanted to fly fish for sometime and now that I am retired I have some extra time. More than likely I will be fishing from shore as I have a motion and balance issue with standing in water on on a boat. Thanks for the tips on the kind of rod and reel I would need to look at. This was really helpful. The ‘fly fishing combos’ item has caught my attention. Do you think that is the best place to start? Hey Steve, fly fishing is a great pastime and when retired you can indulge yourself to hours of time spent on the river banks getting fresh air and sunshine. I heard a saying the other day we don’t get old if you go fishing and I agree staying active is a well documented way to keep health and vitality in our older years. As you mentioned the fly fishing combo set is a really good place to start. You will get in most cases a rod, reel and fly line all matched, balanced and spooled ready to go fishing. Some kits also include a rod tube to protect your gear along with a fly box some flies and leader material. Once you have been out for a while and got better at casting and fly fishing you can then upgrade to better gear although saying that some of the combos available now are very good and will last the occasional fly angler a long time. I have always wanted to try fly fishing but it’s intimidating for someone like myself who is not an experienced fisher. This article is so helpful to really start to learn the gear, the basics and what would be needed. This really makes me not as scared to give fly fishing a try! Hey Lo, it really isn’t that hard. It takes a bit of timing to get the cast working correctly but with a bit of tuition and some practice it will be no time before you can fly fish with the rest of them. I’ve been rocking a reel-less Tenkara rod for a few years now, mainly because I do most of my fishing while backpacking. But I’m thinking about getting a bit more serious about fly fishing in my spare time so I found this article really helpful! Do you have any experience with Tenkara? Would you entertain writing a review of reel-less fly fishing? I have not done any tenkara fly fishing myself, most of the fly fishing I do in in medium to large rivers or stillwater and the need to cast further than 20ft is a must. It is something I would like to try as I can see the simplicity of it and how it would please the spirit. I like all things Japanese and while this only came into world from 2009 it has grown amazingly since Tenkara USA started promoting it. It’s definitely something on my to do list. The full art of fly fishing requires a fly reel and the art of casting becomes a bit more complicated to get the distances required to cover larger sections of water. Give me a shout if you decide to get a fly fishing reel and I’ll try and steer you to something that will suit you. Thanks for the insightful information on choosing a fly fishing reel. I have yet to go fly fishing but I would like to learn so this article has been a big help in getting myself started. I had no idea there was this much to consider when purchasing a fly fishing reel. I will make sure to use all this information when making a purchase. Thanks again! No problem Andrew, glad to hear you got something from it. If you have any questions drop a comment and I’ll try and answer it. This simple page brought back many pleasant memories from my youth. I learned to fly fish in the 1950s from a doctor friend of my dad’s. He gave me a Shakespeare fly rod and reel kit perfect for my young self. He taught me to work the reeds and shallows around our country pond. Taught me to roll cast under trees. I remember spending hours with just myself, the fish and the red-winged blackbirds as the sun went down casting a small dry fly and pulling in bream after bream. I may just have to get back into fly fishing in my retirement. Thanks again for evoking those memories and I’ll check out your recommendations. Thanks for the beginner tips on selecting a fly reel. I have a 25 year old reel that has been neglected over the years, but still works pretty darn well. When I purchased it, I spend the extra money for (at the time) the best reel. So I can say that even though you spend more for the higher end reels, they will last longer…even if you don’t care for them properly. That being said, I think now I would opt to get a less expensive reel and just take a little better care of it. At least then you know it should always be in working order, ready to fish. I’m older now and have more time on my hands. I also share my gear with the kids. This is another reason to go with less expensive gear! Some of the less expensive gear is very good, not great like the more expensive ones but good enough to get you fishing and will last a few years if looked after properly as you say. If you scroll down to the section at the bottom reels under $100 you should find something worth looking at. Great information on how to choose a fly fishing reel. This is something that can be difficult to find some decent information on the internet, but I am glad I found this post. I didn’t know the weight of a fly fishing reel would have such an impact on the overall performance. Definitely something to consider. Hey chris yes the weight can cause problems. To light and the rod tip is too heavy too heavy and the rod tip is too light. Its better if its nicely balanced so the rod lies flat in your hand. The job of casting become so much more simple when its like that. Wow, thank you very much for all this useful information. I love adventure activities and haven’t been out fishing for some time. Recently I was thinking about starting again and am happy to have come across your article. The information you gave was clear and concise and will definitely help me make a better-informed purchasing decision if I decide to take up fly fishing. Good to hear David, that’s what I’m trying to do here at chuckingfluff.com provide information that folks can use to buy better gear for fly fishing. If you need any further advice when going to make a purchase give me a shout back I’ll assist in any way I can.